Beautiful set of real silver. Tough and Stylish at the same time! Engrave a word, date or name on the beautiful engraving bed. Welcome to KAYA jewelry! 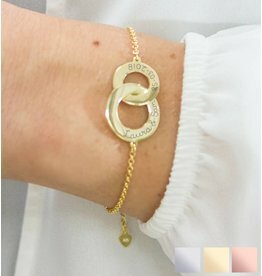 We make special jewelry to remember special moments like the birth of your baby, her baptism , birthday , communion or for the little bridesmaid. 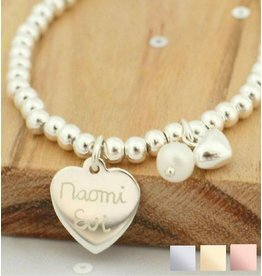 A children's bracelet for her plump wrist adds something special to your special day , then becomes a piece of jewellery to cherish for ever. Extra fun: much of the jewelry is also available in a mummy version, so mother and daughter can shine together. All the jewellery pieces are made of the finest quality pearls, crystals and gemstones. Because KAYA does not hire a studio or advertise and we make and design everything ourselves our prices are cheaper than other jewelry brands. Your gift is packaged with A luxury silver polishing cloth and matching greeting card, ready to give! Her birthday, because they are always there for you, or just because they are the sweetest mom of the world? KAYA makes sterling silver jewelry mom with kids names, words or special dates. Everything is free engraved by an engraver with over 10 years experience. 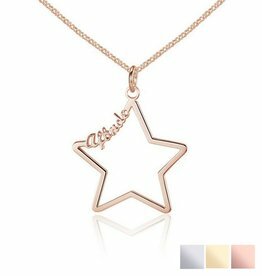 The jewelery is a tangible reminder of important events such as the birth of a baby , or just because you want to say that she is the sweetest mom in the world! Each of gifts they will wear with pride and will cherish forever as a reminder of an important moment. Are you looking for a gift for your mother, sister, lover or best friend? A gift with special meaning what they can wear every day? With this unique jewelry greeting cards is definitely good! Silver chains (gold plating) are thé sieradenhit of 2015 and with the beautiful texts on the card you give a gift with meaning.